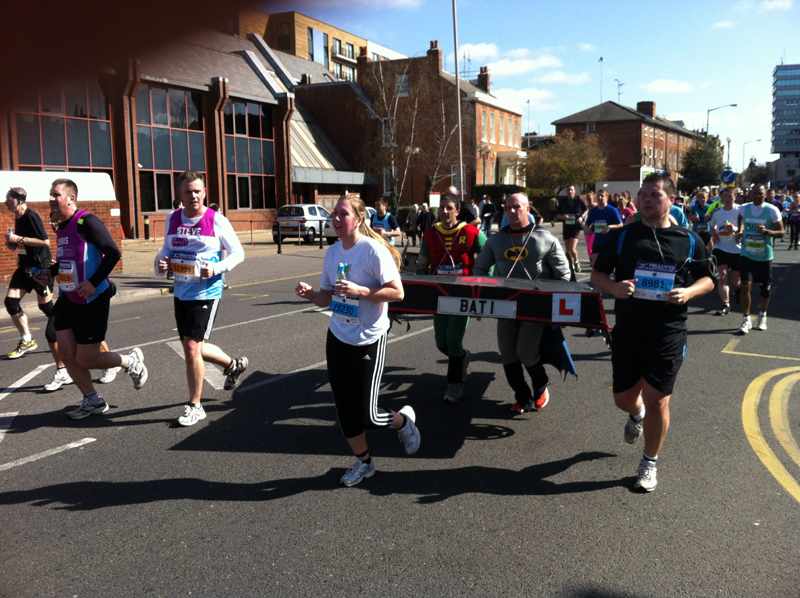 Stouty and I took part in the Reading Half Marathon, once again we were dressed as Batman & Robin in order to raise funds for Cruse Bereavement (www.justgiving.com/runsuperherorun). 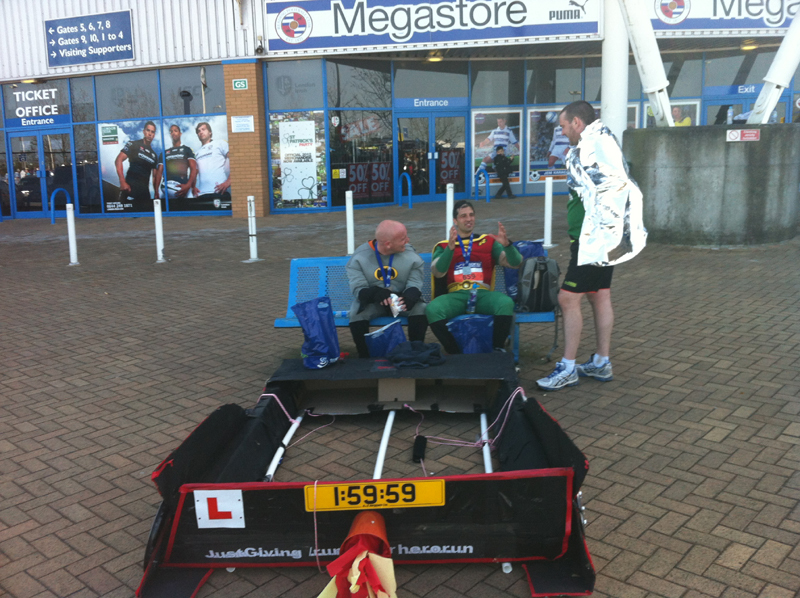 However, there was a little twist here as a Half Marathons are a bit too easy for Ultra Marathon runners. 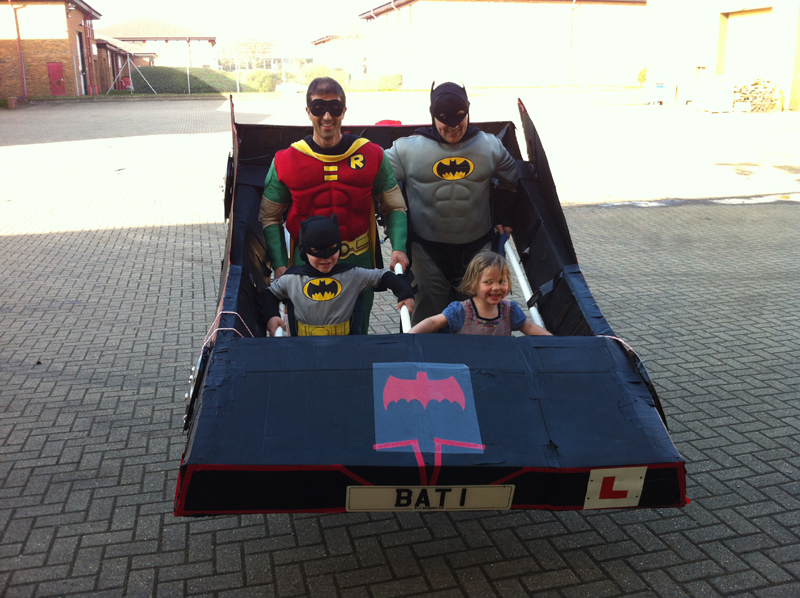 Therefore, we had decided to raise the bar with thanks to Matt and build a Batmobile to carry around the course. I arrived early so I could watch wife and daughter complete the Green Park Challenge before and then went to meet Stouty, Matt (who had transported the Batmobile on a truck) and a few work colleagues who were also running the event. After meeting various friends, we made our way down to the start and buddied up with local radio presenter (for BBC Radio Berkshire) Nicki Whiteman who we had planned to pace around the course. However, our comfortable plans for a 1.59 had been put in disarray with the appearance of the Batmobile and we had settled on a 2.15 time to aim for. We had a brief radio interview with Adie Williams (ex-Reading Football and now Radio Broadcaster) and made our way to the start of the race. The weather was warm and we had both been carrying the Batmobile for half an hour and we hadn’t even started yet. We made our way towards the back of the race and settled in around the 2 – 2.15 group. A few minutes later the race started although it took us 10-15 mins to get past the start line. The good weather must have encouraged the supporters as the crowd support was amazing from the start line to the end (although there were a few areas where the crowd was sparse). However, the Batman & Robin theme seemed to transcend every generation from the odd chant of the 60’s theme tune, to the Delboy & Rodney shout of the 80’s to the general Batman & Robin shout outs. We certainly put a smile on a few people’s faces. We were also accompanied by Harris who designed his own Riddler costume and did a fantastic job on the day of grabbing water at the aid stations, trying to ensure we didn’t bump into too many people, helping repair the Batmobile (more on that later) and he even took a turn in the Batmobile when Stouty’s back was screaming at him (more on that later). We set out at a rough 10m/m pace and started to overtake a few people already. We maintained the pace up the first hill in Whitley which took us past several people who were slowing at this point. However, we then had our first little incident when one of the support ropes snapped. We had planned to carry the Batmobile with some plumbing tubes (like a double stretcher) but the ropes were an extra support. We agreed to leave it and re-tie it at some point. We followed the route through the University and towards Reading Town Centre. We stopped briefly to re-tie the rope as Nicki and Anthony who was running with us continued on and that was the last we saw of them at the 5 mile point. We continued on into town hitting the 6 mile point in just over an hour and through Forbury Gardens (we may have caused a slight blockage under the Arch as there was no room for anyone to pass us)and into the Town Centre where we saw a few friends supporting us. The weather felt really warm and we were both absolutely roasting in our costumes despite Harris grabbinh plentiful supplies of water and to be fair other runners were also offering us drinks on route which was great. As we continued through town, Stouty started to complain about his back and we agreed to march up Russell Street after stopping for a beer at the bottom (thanks to the Pub/people who were giving them out). This absolutely hit the spot for a minute and then my stomach started to churn a little so perhaps it wasn’t a good idea. We continued towards the top of Russell Street and turned into Tilehurst Road where we stopped at the BP Garage for petrol (hey, there were no queues) but they had sold out anyway before carrying on towards Prospect Park where I saw my wife and daughter who had travelled here to watch. We then turned and headed down the Bath Road with about 5 miles to go. At this point, we picked up another runner who was in need of some motivation and she tagged along with us for the rest of the way. 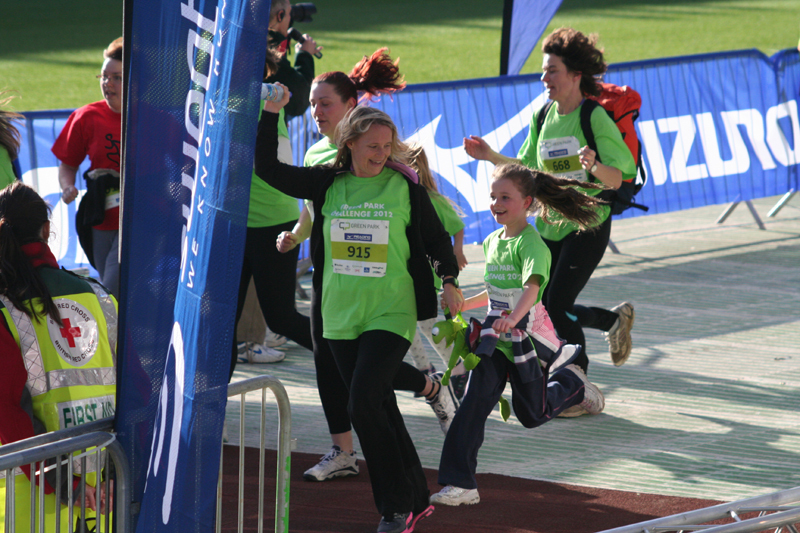 (Stouty shouted at her every time she stopped, but she seemed thankful at the end of the race). The repaired rope snapped again at this point necessitating further repairs and we also lost a small pack of cards with our charity details which fell out of the Batmobile aswell. By this time, the few little pit-stops had cost us a few mins and we were slightly over the 2.15 time. 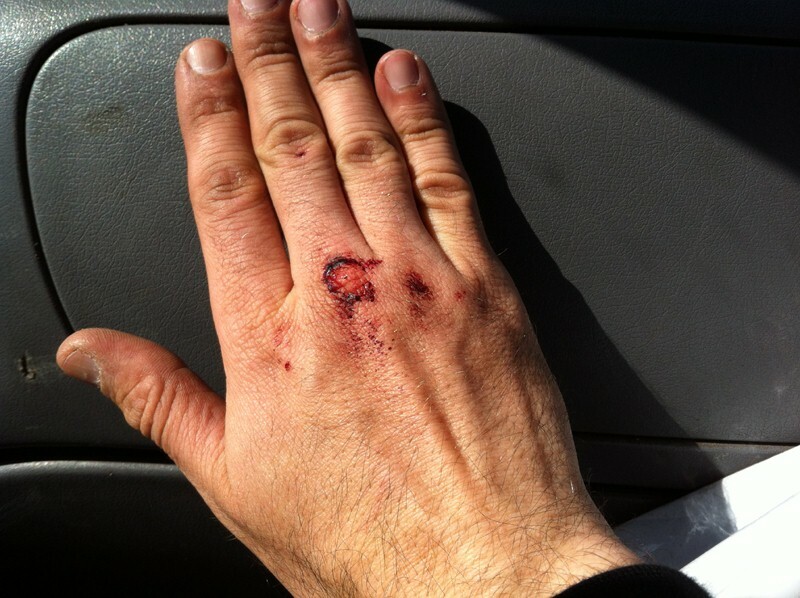 As we headed towards and up the A33, I noticed my right knuckle was covered in blood whereit had rubbed against the (now bloody) side of the Batmobile. I grabbed some vaseline to cover it at an aid point and carried on. As we continued up the A33, Stouty’s back was giving him some trouble so Harris manfully stepped in to carry the Batmobile for a little while to easy the pain. Harris then decided to push the pace towards 8.30 m/m before I told him to ease up as he hadn’t carried this bloody Batmobile for 10 miles! 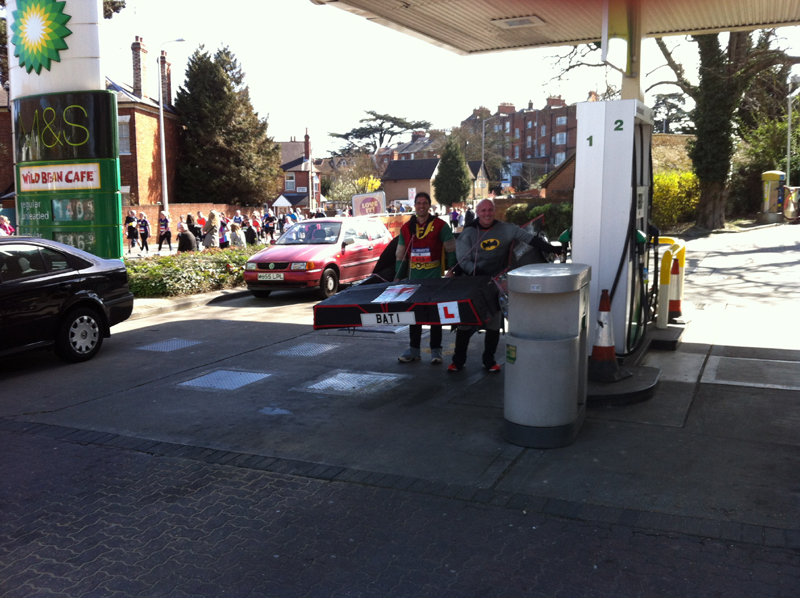 We also spotted Matt Dunn (Fetch Emdee) who has finished in a new PB of 1.29 I believe and he trotted back with us for a few mins before we grabbed some drinks at the next aid station and Stouty took his place on the Batmobile. We trotted the last leg of Green Park to some great support and into the Madjeski Stadium to some fantastic support and picked up the last few yards to finish around 2.18. My arms felt a little sort but my shoulder was absolutely killing me where the rope had been digging into me (the seat belt cover had fallen off somewhere). We spotted Nicki at the end who had finished in around 2.15 which was a satisfactory result as she hadn’t been 100% fit for the run. 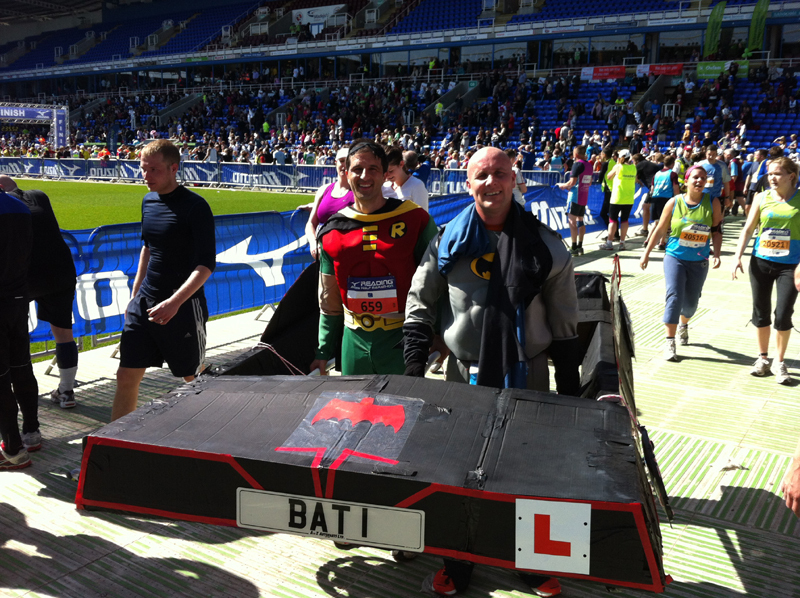 As we were funnelled through the stadium to collect our medals, Stouty had a little moment when he got fed up with carrying the Batmobile and wanted to dump it then and there but I managed to persuade him to carry it back to the truck and return it to my house (an Ebay Charity auction beckons I think – even if it raises just an extra fiver for the charity). We met up with a few friends who generally all seemed to have a good day and then returned home. I will have to say that we stopped for pizza on the way home when I exited a newsagents with a drink I did suffer a momentary dizzy spell where I felt feint and my vision blurred forcing me to sit down for a few moments which I will account to the heat, costume and exertion of the day (lifting effort not running effort). After getting home and having a cool drink, some fresh air and some food then I felt fine but it’s the first time I’ve ever felt like that after a run. So despite our slowest half marathon times ever by some margin it was the most enjoyable half marathon experience ever. A good fun run with some amazing support made it a great day. We hope that making a public spectacle of ourselves will lead to a few extra charity donations. Apologies to anyone who we accidentally bumped on the way round (there were a few I’m afraid), we did do our best to try and avoid them. I have slightly less sympathy for those iPod wearers who had the volume turned up so loud that they couldn’t hear anyone else oblivious of everyone else around them though, they are missing out on part of the experience by running in a bubble.